Chairs - We have a great selection of rustic, mountain modern, and log chairs. 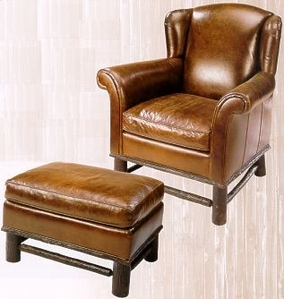 Choose from our traditional leather living room or lounge chairs, comfortable dining chairs, or one of the historical Old Hickory rocking chairs. The varieties seem unlimited. LodgeCraft has been assembling the highest quality chair selection and maintained strong relationships with some of the Nation's leading furniture manufacturers since 1988 which provides you with the best rustic chair selection online. We offer a variety of styles as well as a great selection of wood type and finish options.Lodgecraft has Cherry and Oak Mission Chairs, Pine Log Chairs and hardwood Oak Chairs in a number of designs and options. Sofas - Bring your home to life with the vibrant beauty of these Sofas and Loveseats. Choose from a variety of rustic and western upholstery fabrics and leathers. Rustic sofas and loveseats - Durable and attractive Hickory Sapling and Oak Veneer hardwood or Aged Barnwood. Log sofas, Loveseats and Futons - solid wood with just the right balance of log accents, available in Skip-Peel and Clean-Peel finish. Our Showrooms in NW, Montana also have a selection of upholstered and leather sofas from King Hickory, Leather Italia, England and more. LodgeCraft has all of your living room needs with just the right balance of rustic and log style couches and loveseats. Rockers - Browse our selection of Old Hickory rockers, made with a variety of finishes and fabric options. Old Hickory rockers are exceptionally durable and historical. Come and see the "Glacier Park" memorial 100 year rocker, constructed with the same quality as in the early 1900's.